A Clean City offers all aspects of window cleaning for offices and commercial buildings. All of our specialised window cleaning technicians have received training in rope access work and high flow water fed window cleaning and have the appropriate knowledge and experience. Our organisation holds all relevant insurance policies. This method of window cleaning has revolutionised the industry and its benefits far outweigh other cleaning methods. Water is pumped through telescopic poles which means we can access and clean windows to heights in excess of 15 metres. Clean windows up to 4 storeys or 15 metres high. A Clean City provides a full range of window cleaning services using rope access, or abseiling, for all types of offices and commercial buildings higher than three stories. Rope access allows us to reach many difficult locations with a high degree of safety. 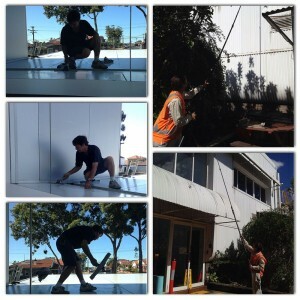 Call A Clean City now to discuss your window cleaning requirements.